The Infinity® Genesis is sure to turn heads with its sleek outer shell and synthetic leather interior. Infinity has spared no luxuries when it comes to this unique model, which features 3D massage technology, allowing you to choose from five intensity levels. For added convenience, there is also a USB port for charging your devices and zero-wall space saving technology. To ensure the most personalized massage, the Genesis SE also includes height-adjustable shoulder airbags, automatic footrest extension, and Optical Body Scanning Technology. 3D massage technology The Genesis's 3D technology allows users to adjust the width, length, and depth (intensity) of the rollers for a more personalized massage. Operate the Genesis right from your Apple or Android device with its app-based functionality. 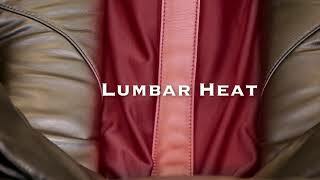 During this full-body stretch, the massage chair's airbags grip your shoulders and legs as it reclines accordingly to soothe and relieve your spine. Replicating thumb and finger techniques of reflexology, the Imperial's foot rollers attend to vital pressure points on the feet linked with other areas of the body. The Genesis's foot rest extends mechanically in order to accommodate the user’s specific leg length and comfortability. The Genesis gently rocks back and forth to relieve your muscles of the pressures of gravity. Rotate the airbags up or down to better fit your shoulders and enhance the decompression stretch. The Genesis provides pressurized massage strokes with four high-tech rollers that methodically knead out muscle tension. The Genesis has airbags located throughout the chair that inflate and deflate to provide a sensation on the muscles that feels like real human hands.